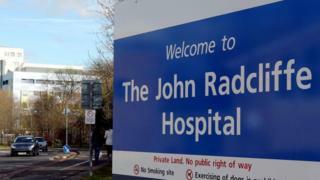 The discovery at John Radcliffe Hospital on Monday prompted an urgent appeal to find the child's mother, who went missing. The woman was later located and "is safe and well", police said on Tuesday morning. Concerns had earlier been raised over her health, and she had been urged to seek medical attention. The baby was believed to have been born at around 18:00 GMT. He is "doing well and is being cared for by medical staff," a statement from Thames Valley Police said. The mother is "being provided with medical treatment," it added.